Here in Vermont summer comes on rather suddenly, almost without introduction. Only two days ago we had to turn the heat back on in the house and there was an overnight frost warning. At least we didn’t have snow! I think this sense of suddenness is due to the fact that spring is such a tenuous season for us… we suddenly notice a swath of bright fresh green across mountains, and the appearance of flowers, while at the same time keeping our sweaters within reach and our winter blankets out. During the early days of summer we alternate between 80 degree days and 50 degree days, sometimes not feeling the warmth of a day until well into the afternoon. At what is known as “midsummer” we have just realized that yes, warmth and sunshine have returned to our lovely state. Even though winter has its beauty, it does tend to get long up here, and we are all grateful for the return of summer. It seems fitting then, to actually celebrate such a time as this, not just for the outward abundance of life that is all around us, but also to reflect on where we’ve been during the first half of the year. It is of benefit to recognize not just the blossoming that is everywhere, but the progress and growth we have made in our individual lives. In ancient China people saw summer as the most yang time of year, for its elements of heat, light, and dryness. At the time of the Summer Solstice, yang energy was at its peak and then diminished until the Winter Solstice. Yin was born at the Summer Solstice, and reached its peak at the Winter Solstice. This portrays a sense of balance that we can see clearly when thinking in terms of light and dark halves of the year, and this sense of balance was an important element in celebration. The birth of yin was celebrated around the time of the Summer Solstice, and thus, it was a time for people to honor the feminine – yin is generally associated with the feminine, dark, and the earth. Many worshipped the goddess Li, and outside the walls of the Forbidden City the emperor led ceremonies at the Altar of the Earth. How might we create a sense of balance for ourselves, or honor the feminine, at this time when yang is peaking? Yang is a very outward, external energy… We can honor the yin by going within in introspection. The yang of summer is very hot and fiery – we can counter it by doing things that bring coolness, perhaps taking a dip in a lake or simply standing in the water at the edge of the ocean. In China this is also a time of choosing to eat healthy and light – noodles become more popular than dumplings and actually sell out during the Xiazhi festival, celebrated during the Summer Solstice. I live near a beautiful little waterfall, accessible by a wooded path along a river. 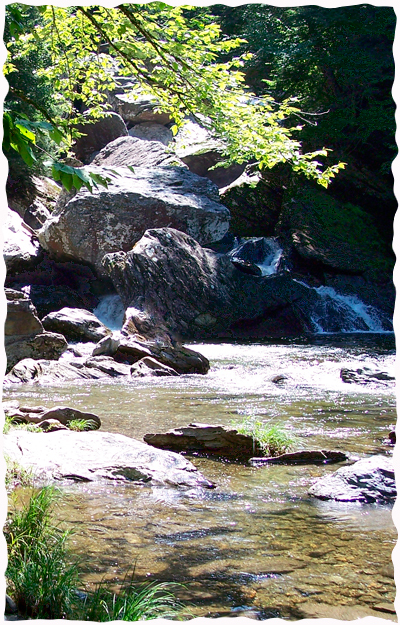 If the weather here is hot and sunny, I think the Solstice would be a perfect time to walk down to the falls – perhaps with a picnic of cold noodles and fresh juice, sit quietly in meditation, and then slide into the cool, yin waters of the pool beneath the falls. I hope that wherever you are, you too get a chance to honor the feminine, and find balance within yourself and the world around you, celebrating the natural rhythm of time’s passing and nature’s progress.